Brandon McCoy averaged 19.7 points and 18.3 rebounds a game as a sophomore last season for Morse. 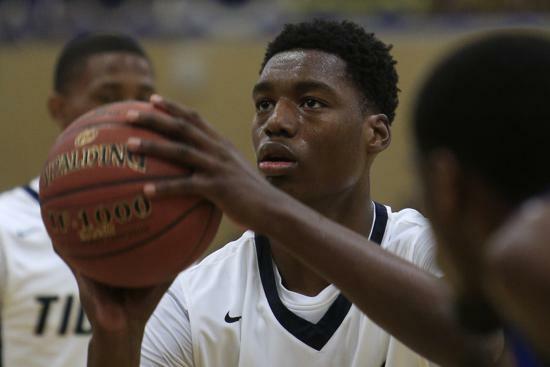 Brandon McCoy, one of the most dynamic high school basketball players in San Diego, has left Morse and is going through the admissions process at Cathedral Catholic. The 6-foot-10 McCoy averaged 19.7 points, 18.3 rebounds and 6.6 blocked shots a game for the Tigers as a sophomore last season. The All-San Diego Section first-team pick is listed as a five-star recruit by Rivals and a four-star recruit by ESPN. McCoy has drawn college interest from Arizona, Cal, UConn, Georgia, Kansas, Oregon, San Diego State and Michigan State among others. Morse was 26-7 last season, losing to Escondido in the section Division I title game at USD. With a team dominated by sophomores and juniors, Cathedral Catholic was 17-9 last season, losing to Poway in the Division I quarterfinals. Point guard Jaylen Hands — five stars ESPN, four stars Rivals — has been denied eligibility by the CIF’s San Diego Section in a transfer from Mater Dei Catholic to Foothills Christian. Hands, an all-section first-teamer last season as a sophomore, has appealed the decision to the California Interscholastic Federation’s state office. Jordan Starr, who will be a sophomore at Foothills Christian, has been selected as a member of the 17U Australian National Basketball Team. Starr, a 6-foot-6 guard, is the only player not born in Australia on the team. He’s eligible because his father was born in Australia and coached basketball there. Starr, who played all 32 games for a 24-8 Foothills Christian team last season, averaged 2.9 points and 2.8 rebounds a game for the Knights. He survived an Australia tryout camp in Canberra and will travel with the team to Wellington, New Zealand, for the FIBA 17U Oceania Championship. Starr, who plays club ball for Top Gun Basketball Academy, is drawing college interest from San Diego State, Boise State, Saint Mary’s, UC Irvine, Santa Clara and Rice among others. Big-name players who have competed for the Australian 17U Team include NBA players Dante Exum, Patty Mills and Matthew Dellavedova. La Jolla Country Day standouts Mai-loni Henson and Alaysia Styles wore different jerseys for the All-Star Girls Report’s summer league all-star game this month in Charlotte, N.C. The game featured many of the nation’s top girls basketball players from the 2016-19 classes. All-Star Girls Report is a national recruiting and ranking website. Henson, who will be a senior, played for the West. Styles, who will be a junior, played for the East. LJCD’s Terri Bamford coached the West to an 84-77 win.